It seems that we've skipped right over Autumn and headed straight from summer into the deep freeze of winter. In the late-September week that Cakes and I were away, all the leaves fell off the trees on our street with a great "WHOOOOMPH!". Well, at least that's what I reckon it would have sounded like if we'd been around to hear it. And now here we are in winter. There's been a fair bit of snow on the ground for over a week now. It's not the come-and-go melty kind of snow. It looks and feels like it's here for the duration. The sidewalks are slippery. There's frost on the windows of my car in the mornings. The entryway in the back of the house is a permanent puddle from the snowy shoes. But the surest sign that winter is indeed upon us? My cooking and eating preferences have made a distinct shift away from fresh and green to stewy, saucy, rich and spiced. Since September and October were so unbelievably busy for me, I kind of feel like a stranger in my own kitchen. We've been eating way too much takeout and prepackaged foods, all terribly salty and fatty and not very good. But now, as the homebody season of winter gets into full swing, I swear that's going to change. This afternoon I felt like something sticky and cinnamony and sweet. Something that would fill the house with the warmth of the oven and the smell of baking. And this recipe is just what the doctor ordered. I made it with a simple sponge cake, but I have the feeling that it would be even nicer with a tender and dense vanilla pudding cake, as the sponge cake is less moist than a regular cake. Preheat oven to 370F. Grease bottom and sides of a 9" springform pan with the tablespoon of soft butter. Layer apple slices in the bottom and sprinkle with brown sugar and cinnamon. In a stand mixer whip eggs and vanilla sugar on high for 8 to 10 minutes, or until pale, fluffy and greatly increased in volume. Sift together flour, baking powder, cinnamon and ginger. Fold flour mixture into eggs one third at a time. Fold in melted butter. Pour batter into pan and bake in the centre of the oven for 20 to 22 minutes, or until sides start to come away from the pan and the top springs back when touched lightly. 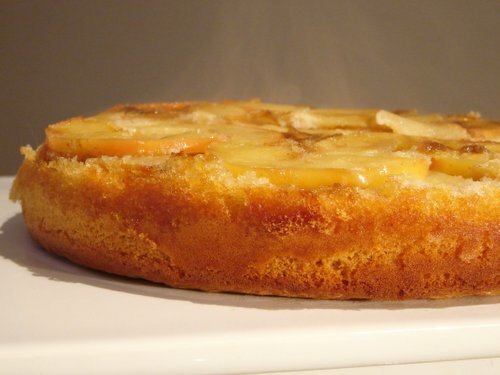 Run a knife around the edge of the pan to loosen the cake and invert onto a cake stand to cool. In a medium saucepan over medium heat, combine cream, sugar and vanilla pod, using the tip of a knife to scrape out the seeds into the cream. Stir mixture until sugar dissolves completely. Increase heat to 3/4 and bring to a rolling simmer. Allow to simmer for 8 to 10 minutes, or until the caramel starts to thicken visibly. Remove from heat. Use a fork to fish out the vanilla pod. Stir the brandy into the caramel. 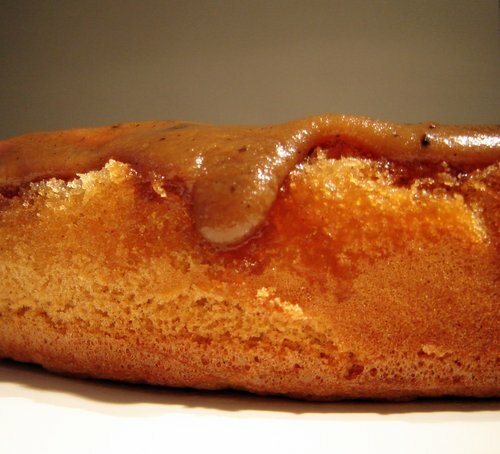 Pour caramel over the cake. Serve warm. i love that last photo showing the layers. what a perfect fall treat! Waou, it's really beautiful ! I can't believe you have snow! We have upper sixties to mid seventies, and lots and lots of rain. the temperature will drop for a few days, and I think I can finally put away Alex's summer clothes. Next day? 68 and sunny. And I'm soooo ready for winter. I'm listening to Christmas CD's, and wondering if it's too early to put up a tree?! OMG - you had me at the first picture! And there are few dessert combinations that I like more than apples and caramel... Roll on winter puddings! this looks (and i bet tastes) amazing! yum. I tried out this recipe and it was fabulous, although I omitted the ginger and greatly reduced the cinnamon.